B_ifill – The new INDEX-6 synhroblock. 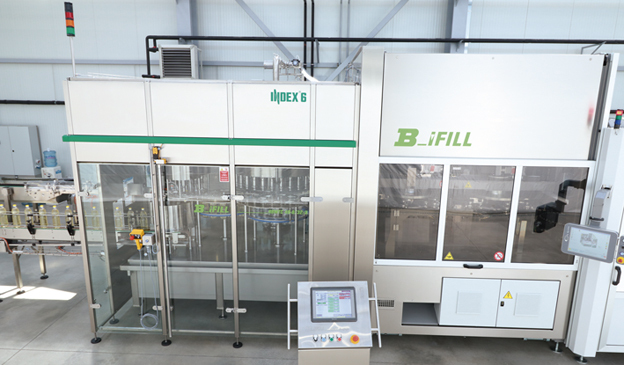 B_ifill – The new INDEX-6 synhroblock with blow moulding of the bottles, filling and closing is already a fact! The first rotary synchroblock with direct supply of bottles form blow molding module to the filling block is designed in direction to combine in compact solution the processes of blowing, filling and closing without loss of space, energy and time, in order to reduce needed format parts and in order to increase hygiene. The integrated system for automated control of the processes of transfer and synchronization, filling and closing by means of dual operating system. The filling valves set is subject to individual control of each single valve at any moment during dosing. B_ifill operates in a clean environment with neck handling for higher efficiency and hygiene. The flexible connections in the product tract are reduced. Completed for automatic sanitizing of the working chamber in the filling part. Pick & Place system on the closing column is provided be elevator-orientator for feeding of oriented caps, completed also with systems to check quality of closing. B_ifill is capable to fill different edible liquids (water, milk drinks, juices, edible oils, ketchup and many other products) at different levels of hygiene and capacity in many types of bottles (containers). More information about the synchroblock you can get from our Commercial Department.